Over the past couple of months, I have been trying out a new ethos and eating style on for size. It‘s a change that I haven’t taken lightly. During this time, I‘ve spent hours upon hours analysing my thoughts and beliefs around ethics and health when it comes to my dietary choices. This lead me to question all of the rules and restrictions I had placed upon myself in order to fit within the parameters of what is required to wear the “vegan” label. Something that I have worn proudly for the past (nearly) four years. Before I proceed, I would just like to point out that I haven’t turned my back on the movement or my animal friends. All I’ve done is decided to reintroduce some of the foods I had previously striked out of my diet in order to adopt a strict vegan diet as I personally believe they are morally acceptable and profoundly good for health. Following a strict vegan diet (or any diet in that case), can feel dogmatic at times when you’re a naturally inquisitive person like myself. As such, I have started to listen to my own intuition by incorporating these particular foods back in. Essentially, I’m still following a plant-based diet – a diet full of fruit, vegetables, nuts, seeds, grains, legumes and plant-based protein. The main point-of-difference is the inclusion of honey and bivalves. I’m pretty confident that almost everybody knows what honey is… but what the heck are ‘bivalves’? Bivalves are a class of marine mollusc which includes oysters, mussels, clams and scallops. In terms of their biological hard-wiring, they don’t have a brain or central nervous system thus it seems extremely unlikely that they have the capacity to feel pain, to be sentient or to experience consciousness at all for that matter. When looking at the environmental impact of farming bivalves such as oysters and mussels in particular, it actually appears to be beneficial to the environment. Being filter feeders (meaning they get their nutrients in from filtering algae and plankton), they improve the water quality of their environment. Lastly, when looking at their nutritional value, these molluscs pack a mighty nutritional punch! For example, in one serving of oysters alone, we plant-based eaters can get over 200% of our daily B12 intake, 110% of our daily Zinc intake and a considerable amount of Omega-3 fatty acids (EPA and DHA). These nutrients in particular are not easily found, or cannot be found at all, in a purely plant-based diet and otherwise should be supplemented to maintain optimal health. I could ramble on and on about this topic but there are already some really great blog posts that have been written regarding the ethical case for, and health benefits of, eating bivalves which can be found here, here and here. With regards to honey, there are so many arguments for and against the ethics of its production. I personally find it difficult to empathise with an insect, especially since their capacity to feel pain or to be sentient is something still being hotly debated to this day. Does that make me a terrible person? I’m not sure. What I do know however, is that more bugs and insects are killed in the harvest of the plant-based food we eat than in the production of honey. In addition to this, many of the foods we eat on a plant-based diet (including almonds, blueberries, eggplant, squash etc.) require pollination from bees to produce. These plants are typically pollinated by bees – the very same bees that are being used for honey production – which makes me feel like it’s a little hypocritical to condemn those who choose to include some honey in their diet. In terms of health benefits, unpasteurised, raw honey is known to have antibacterial and immunity boosting properties as well as being an antioxidant powerhouse. For an interesting perspective on how honey-bashing hurts the vegan movement, read this. For some more information on the health benefits of honey, read this. Aside from these controversial additions, I have also started to supplement with B12, Vitamin D3, Omega 3 (EPA & DHA) and plant-based protein powder. The supplements themselves are vegan and I’ve been taking them daily for the past two months. In additional to this, I have also altered my macro nutrient ratios to include a higher amount of fat. To do this, I have reduced my carbohydrate intake and increased healthy fats (such as avocado, coconut oil, olive oil, nuts and seeds). These changes in my diet have had PROFOUND effects on my overall health (especially with my energy levels). I feel the best I have ever felt in my entire life… even Josh has noticed the changes in my energy level and mood and comments regularly that he thinks I’m on drugs because I can just keep going (such a sweet talker). I’m so excited about the how good I’m feeling and I’ll write a more in-depth post about this soon. So where does that leave me now? I’m not 100% sure, but after doing some quick searches on Google I was introduced to the term ‘Ostrovegan‘. Sounds pretty funky, but essentially it’s a modified vegan diet – one that allows the consumption of bivalves. Labels aside, the real take away I’ve had from this journey of self-reflection is that it’s important to trust your own intuition and do what you truly believe makes the most sense for you. For me, that is to continue to live as ethically and healthfully as I can, in a way that resonates with my own values and beliefs. Great post. I had a similar stage in my journey to live as ethically as possible around a year ago. I had been a ‘vegan’ in the strictest sense for almost a decade by that point and felt that some of the finer points of the lifestyle did not sit well with me. I disliked that it did not take into account human exploitation and poor agricultural practices. I started eating honey again after reading about sugarcane growers being exploited in so many parts of the world. I stopped buying my produce from supermarkets because of migrant worker abuse on Australian farms and instead set out to grow most of my own produce (boy, has that been a learning process! my thumb is far from green lol!). 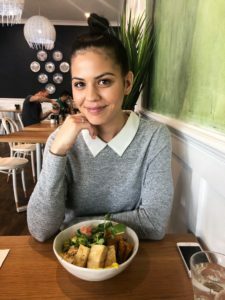 I wholly believe in people labelling themselves as whatever they please, but I disagree that veganism is ethical and cruelty-free, because most commercial farming practices are not sustainable, and are inhumane and involve the exploitation of the poor and of people of colour. I look forward to reading more of your journey to living an ethical and sustainable lifestyle. Thank-you so much for taking the time to read my post and for your kind words. Wow, what an inspiring journey towards living as ethically as possible – I tip my hat to you. I completely agree with you; when it comes to living ethically and sustainably, it’s not as simple as being black-and-white. There are so many grey areas that are so often overlooked, especially when it comes to food production. I’ll be the first to admit that I’m quite ignorant when it comes to the human rights issues associated with these industries, having solely focused on the animal rights angle for all these years. That being said, I am now going to make a point of educating myself so I can start to minimise my contribution to it all. For over a year I have been contemplating starting my own veggie patch. I’ve always wanted to grow my own fruit and vegetables and your comment has given me the motivation and inspiration to kick it into gear!